NB:Basically the higher the ASPECTs score the better the prognosis. High scores such as 10 are normal and low scores < 5 suggests evolved ischaemic changes. A normal CT scan has an ASPECTS of 10 points. One point is subtracted for ischaemic changes in each region of the MCA territory. The ASPECTS score has some clinical correlation. A normal brain has a score of 10 and as more areas are affected the score falls. 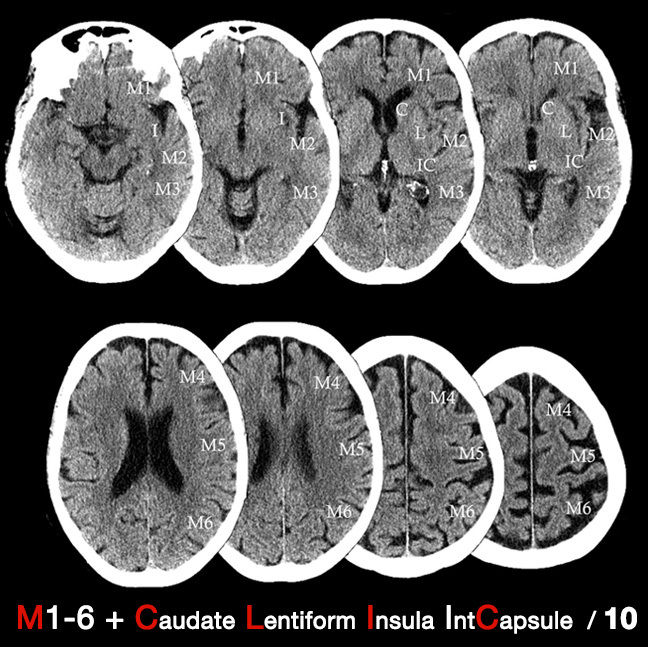 A full MCA territory infarct with CT changes would have a score of 0. A sharp increase in dependence and death occurs with an ASPECTS of 7 or less. A common misunderstanding of ASPECTS scoring is to assess only two standardised cuts, i.e. one ganglionic cut through the thalamus and one supraganglionic cut above this. Be sure to include the assessment of all axial cuts of the brain NCCT scan. The ASPECT score is not needed prior to thrombolysis but it does give an element of quantitative rigor to assessing the CT analysis and may be mentioned in any discussion with a stroke physician so useful to have heard of it. The aspects does not incorporate ACA and PCA territories but adjacent infarcts may well have clinical implications. The ASPECTs scoring system has been utilised in many ways. It has been used to prognosticate for example the score is a strong predictor of functional outcome. It has also been used to direct therapies. The effectiveness of intra-arterial thrombolysis in patients with middle cerebral artery occlusion shows effect modification by the Alberta Stroke Program Early CT Score. 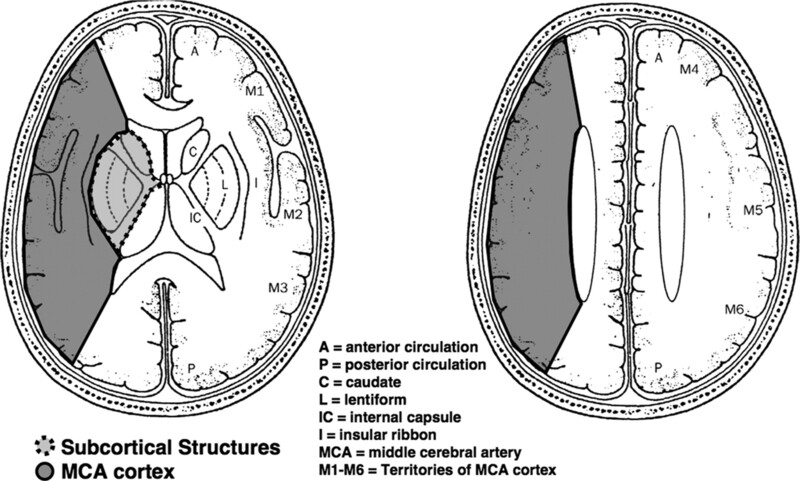 Those with a low ASPECTS score suggesting large MCA infarction can be excluded from futile intra-arterial treatments which are unlikely to result in patient functional independence and increases the risk of haemorrhage. Barber PA1, Demchuk AM, Zhang J, Buchan AM. Validity and reliability of a quantitative computed tomography score in predicting outcome of hyperacute stroke before thrombolytic therapy. ASPECTS Study Group. Alberta Stroke Programme Early CT Score. Lancet. 2000 May 13;355(9216):1670-4.